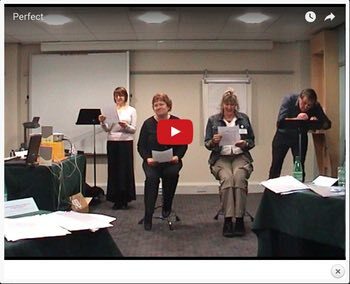 Readers’ Theatre (RT) combines expressive reading supported by simple theatre conventions such as: basic entrances and exits, minimal mime, minimal props such as music stands for narrators and, occasionally, sound effects. Readers are able to hold scripts so there is no need for memorisation. Rehearsal time fits into the time available. Theatre conventions can be illustrated quickly using a very short script such as a joke. Here is a class of 14-year-olds performing a joke about an airplane emergency. There is one narrator, one character (the pilot) and 4 ‘engines’. RT is most often created out of fictional stories but other literature such as news, documentary, history and philosophical dialogues can also be used. The style is ‘presentational’ so narrators often convey much of the story. However characters sometimes take on bits of the narration in order to achieve a balance among speakers. We illustrate this using an extract from ‘The Princess and the Pea’ by Hans Christian Andersen. The following extract could all be spoken by a narrator but a performance can be more dynamic if characters take a share. PRINCE: But she should be a real princess. RT Scrips can be created by or provided for the participants. 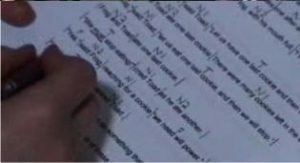 It is clear that the act of scripting is an interesting challenge, forcing readers to structure phrases and sentences with an eye towards the impact of the text in performance and its meaning. Consider, for example, the last third line above. It wouldn’t make sense to have the prince say ‘he travelled about’. The sentence has to be split at just the right place to work. There are several narrators not only one. Different characters often have different narrators. Narrators have scripts on music stands. Some characters make and entrance simply by turning to face the audience. 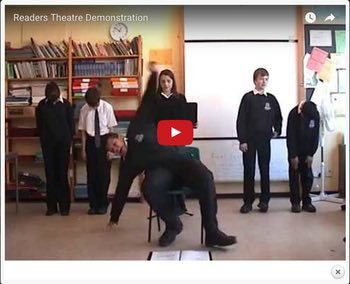 I’ve added some attachments to give further information about Readers’ Theatre conventions and practicalities. Readers Theatre Scripts: There are some good ready-made scripts at Aaron Shepards RT page. They are mostly folk tales from around the world.